Since a very young age Nyané has been interested in all things fashion. As little child she would organise little catwalk fashion shows at home and make everyone watch. She would try and put together interesting and creative outfits. Luckily, Nyané’s parent picked up on her fashion interest very early and bought a sewing machine for her 13th birthday. Nyané has been designing and hand making her own fashion creations since. When she took to social media a few years later she had already gained enough skills to be able to offer custom designs to her fans and followers. 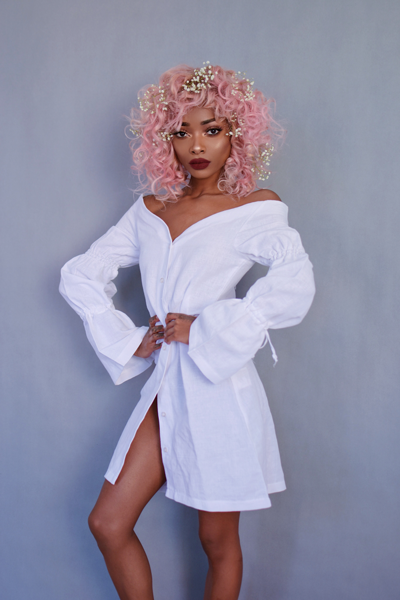 After her social media career had taken up most of her time in the past few years, she is finally back to fashion design and is ready to start out with her own personal fashion line appropriately named after her, “Nyané”. With her first drop, the debut collection, Nyané is attempting to create a mix of all her favourite styles in contemporary and classic fashion design. Reaching from effortless and timeless summer wear to rather more complex pieces, Nyané has managed to put together a complete and at the same time compact collection which will be a perfect start to her journey into the world of fashion design.